The aftercare following PicoSure laser tattoo removal is very specific and it’s important for patients to follow the directions carefully. Although the PicoSure laser is very gentle on the skin, the superficial blisters and overall treatment area must be supported with proper care to ensure that the maximum amount of ink is removed and that the skin itself remains healthy and resilient throughout the series of treatments. Occasionally I have patients who take their aftercare into their own hands and disregard my advice. Some worry that the site will become infected and they proactively apply the topical antibiotic Neosporin which is a known irritant. Topical antibiotics may cause either allergic contact dermatitis or irritant contact dermatitis. Neosporin may actually cause a worsening of the original condition which can be misdiagnosed as an infection. In fact, the American Contact Dermatitis Society (ACDS) named neomycin the 2010 Allergen of the Year! Once the ointment is discontinued the skin can resume healing normally but residual discoloration or redness may last for some time. I’ve also had patients soak in Epsom salts (not recommended) or apply hydrogen peroxide (definitely not recommended!). Some others will ask me if they can use a specific product other than what I recommend. I had one such request recently for Silvadene which is a prescription-only topical cream that’s used to prevent infection in third degree burns. My answer: your treatment area is neither infected nor burned so there’s no reason to apply a powerful medication such as Silvadene. All medications have side effects and in fact the silver in Silvadene can even leave a permanent blue discoloration of the skin called argyria or delay healing. We must remember that the blistering which follows PicoSure laser tattoo removal sessions is not thermal in nature. Rather, the PressureWave with Boost causes minor blistering by vibrating and disrupting the superficial outer layer of skin cells called the stratum corneum. When this occurs, clear fluid will pop out a blister. Do not confuse minor blistering with a burn or infection. I have all of my PicoSure laser tattoo removal patients wash the treated area with a mild soap each day, apply a liberal amount of Cortisone ointment and cover it with a protective dressing until the blisters have subsided. This supports the skin, protects it and prevents any blisters from being torn off during routine daily activities. 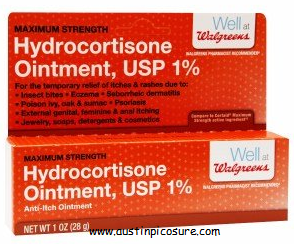 Additionally, the cortisone in the ointment controls post-treatment inflammation which may reduce unwanted pigmentation changes. By carefully cleansing and protecting the treatment area, we ensure that the skin is ready for the next treatment. Eventually, the area will look as though it had never even been tattooed. If you have a tattoo you want removed professionally, safely and effectively, I can be reached by phone @ 512-479-9997 or just stop by my NEW location in Austin, TX: Austin Medspa on W. 6th St.